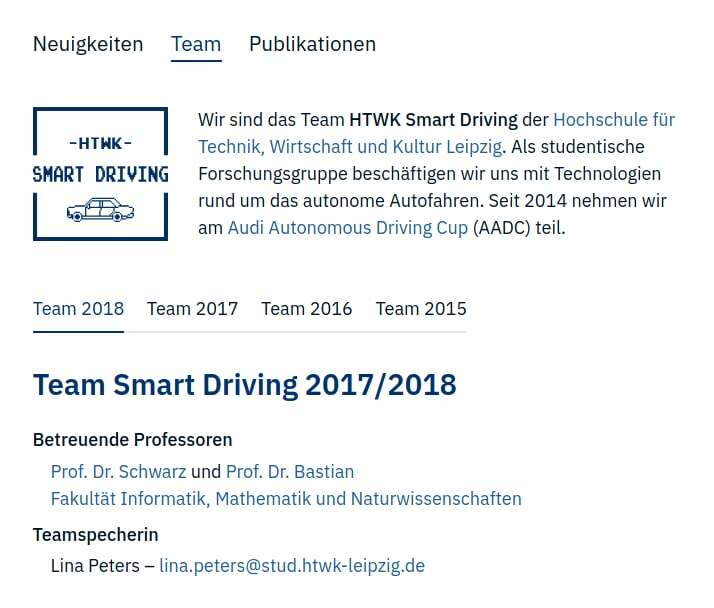 This is the Gatsby JS based website of the HTWK Smart Driving team. You might want to use yarn instead of npm. Some features like the RSS feed (/rss.xml) are created in production builds only. Adding a post is easy! Start the development server as descriped in the previous section (npm run dev). Add a new directory for the new post under src/posts/ and give it a meaningful name. Note that this name is only useful for other developers and has nothing to do with the resulting URL structure. The website should show the newly created post and reflect content changes immediately. This means you can write your post in the markdown file and the page updates itself automatically. Commit your changes and merge the branch into master when you're happy with your post. Careful: the post will go live immediately (see Deployment). Every time a branch is merged into master (or commits are pushed to master) a GitLab pipeline is started, which builds the Gatsby project and deploys the build articafts to the website document root /var/www/html afterwards. So the page goes live immediately!